I was able to pick-up a SNES mini a few days ago online for the Australian price of $126 (that included shipping). It was a limited window sale on ebgames.com and since I knew it was difficult to find at retail decided to take the plunge (it is currently selling on Ebay for $190). Sits nicely in the Nintendo section. (The NES and SNES have moved to the shelf now that the Retron 5 is hooked up). I was not all that interested in the system, since I have almost all of the games that come on the system, and by last count five SNES or SNES clones on which to play them, but relented on the basis of it's convenience and reliability. Old carts work reliably in the original hardware, but the original hardware does not display that well on HDMI. The downside of the clones like the Retron 5, is that often the emulator does not include the cart you want to play. This way I can play most of the classics, with the benefits of save states, with a high degree of convenience. 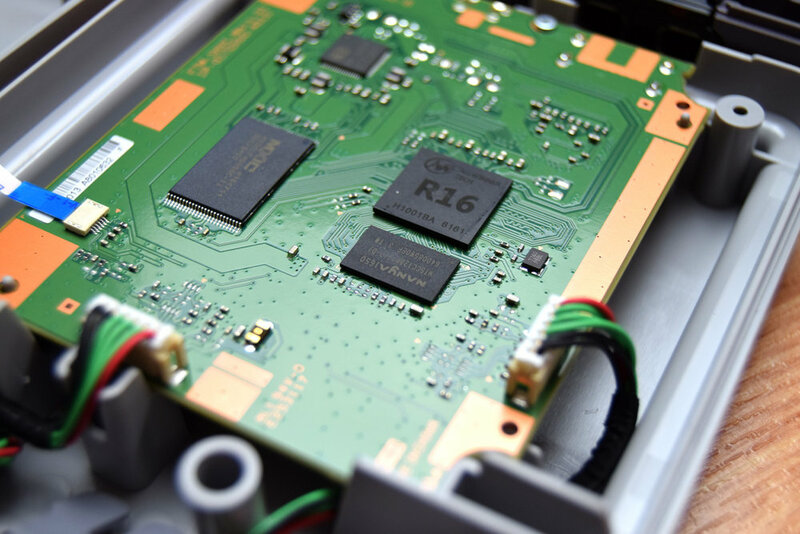 Inside the SNES mini, looks just like the NES mini. Photo courtesy of https://mynintendonews.com/, please visit their site. Here in Australia we get the EU version, which comes with two of the four colour buttons, as opposed the violet and purple buttons of the NTSC version. The downside is the buttons are all convex, unlike the top two buttons on the NTSC version which are concave. Oh and... the cables are too short, okay if you are outputting to your PC monitor, but in the living room you won't be able to sit on the couch and play at the same time. The only other down-side is that you'll need to supply your own power. Nintendo provides a USB cable, but no wall adapter. I used a Samsung micro-USB charger and it worked fine. All in all, it's a nice little package, and well worth the price. For reference, here are the games on the system.